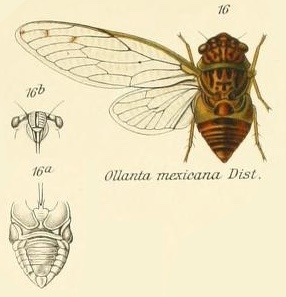 Ollanta mexicana Distant, 1905, is a cicada found in Mexico. Characters. — Head (including eyes) broader than base of mesonotum, eyes projecting beyond anterior angles of pronotum, vertex at area of ocelli about or almost as long as the front; pronotum shorter than mesonotum, its posterior angles labately produced, its lateral margins obliquely narrowed anteriorly, very slightly sinuate; mesonotum moderately convex; abdomen short, about as long as space between apex of head and base of cruciform elevation, tympanal coverings large, their apices subacute, anteriorly but not interiorly covering cavities; rostrum reaching posterior coxae; opercula small, transverse, only about reaching base of abdomen; face moderately globose; tegmina and wings hyaline, the first with eight apical areas.